Diatom: People just don’t seem to understand. Without me and all the other phytoplankton producing oxygen via photosynthesis, people wouldn’t have half the oxygen they need to breathe! We’re also the base of the ocean food chain that supports the fish they eat, and all the carbon dioxide I take up from the air to make into my body would still be in the atmosphere, making the earth heat up. Why can’t they see how important I am? Therapist: I’m hearing that you feel undervalued. Why do you think it is that people don’t understand? Diatom: I suppose it’s because I’m so small. They can’t see me without a microscope, so I might as well not exist! But that’s not my main problem. I can go on fine without humans knowing how much they depend on me. The thing that’s really getting me down is all this stress I’m under. Therapist: Tell me what you mean. What’s causing this stress? Therapist: I see. Why this is causing you such stress right now? Diatom: So, I live in the Southern Ocean around Antarctica. The waters there have plenty of nitrogen for me to use, but there is almost never enough iron to go around. I have to compete with other phytoplankton for my iron, and I also have to compete with bacteria. It’s particularly annoying that I have to share this scarce resource with the bacteria, because the way they get by in life is only through exploiting the carbon that we phytoplankton make for them. It just seems unfair! Therapist: Correct me if I’m wrong, but it sounds to me like there’s more to this story. Diatom: Uh, I suppose. My relationship with those bacteria—well, it’s complicated. Even though they take that scarce iron from me when I need it most, I just can’t live without them. When the bacteria grow and die, they release vitamin B12 into the water. I need that B12 to grow. And just like iron, it’s in short supply relative to the other ingredients I need. Without enough of those bacteria growing, I can’t get enough vitamin B12. Without enough iron or B12, I get really stressed! It’s just a bad cycle. Therapist: It seems almost like sibling rivalry. You and the bacteria are dependent on each other, but at the same time, you’re also competing with each other for iron. That’s quite a delicately balanced relationship you have to negotiate there in the Southern Ocean. What are some strategies you use to try to cope with this stress? Diatom: Life really gets difficult for me when I start to get starved for iron or vitamin B12. First, I try harder to get these missing nutrients. I make more of proteins that I use to find and transport the iron or vitamin from the seawater into my cell. I also make more of the proteins that I need to move the iron or vitamin around inside my cell. This way, as soon as I find the nutrients I need, I’m ready to use them. Therapist: These seem like good strategies. But what happens if they don’t work? Diatom: Well, I try to get by with less of whatever I’m feeling starved for. Sometimes I can substitute some other nutrient for the scarce ones, but this doesn’t always work very well. I just can’t work as efficiently when I’m starved, but I can make do and grow more slowly for a while. If supplies of these nutrients are too low, I just won’t survive. You can see why this is causing me such anxiety. Therapist: Yes, your reaction seems perfectly natural. Let’s try to think of ways to manage this stress. Are there any ways you could predict what nutrients you are going to be starved for? Diatom: Well, I’m not sure. I know that oceanographers are looking into this, too. They want to know what nutrients starve me and the other phytoplankton. But they don’t seem much better than me at predicting which nutrients are limiting how much we can grow. Until a couple of years ago, the scientists weren’t even sure we could be limited by the lack of vitamin B12! Therapist: That’s interesting. Go on. 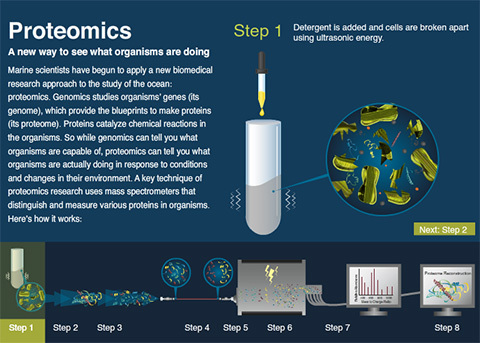 Diatom: One way scientists find out about what controls our growth is to take some of us out of the ocean, put us in bottles, add different nutrients, and watch to see which make us grow faster. This doesn’t make a lot of sense to me, because I know that being in a bottle can make us plankton respond to nutrients differently than we do growing in the ocean. There just has to be a better way. Therapist: Yes, yes. But I’m afraid we are out of time; let’s pick this up again next session. Therapist: I did some research after last week’s session and found something that may help. It seems that some scientists are actually finding new ways to learn about what starves you phytoplankton. Really. The way they are doing this is by looking closely at changes in the way you grow when you are starved for specific nutrients, particularly vitamin B12. They are just learning how to measure those coping strategies you told me about last week. They have developed new technologies that allow them to detect and measure the proteins that organisms make when they are grown under different conditions. Diatom: Are you saying that ocean scientists think they can tell when we phytoplankton feel starved for B12 just by watching what kinds of proteins we make? They actually are interested enough in phytoplankton to make new methods to do this? Diatom: They come up with fancy names, those scientists. If only they could learn how to measure those—what did they call them, B12 … starvation indicator proteins?—if only they could measure them in the ocean instead of just in the lab! If they did, they could figure out what controls all the patterns and processes that lead to us getting starved for vitamin B12. I’d sure love to know that. Then I could be prepared for the stress. That would make life so much easier! Therapist: I know that they are doing their best. In order to use these measurements to learn about what stresses you, the scientists will need to measure these proteins from within a very complex mixture of many thousands or even millions of other proteins in the ocean, and they must also be sure they understand why you make this protein. They are getting closer! Diatom: Wow, that’s great news. I feel a little better already. It’s comforting to think that those scientists aren’t overlooking me and care so much about me and my stress! This research was supported by a National Science Foundation (NSF) Graduate Research Fellowship and an Environmental Protection Agency STAR Fellowship, the WHOI Ocean Ventures Fund, the NSF Ocean Sciences Division and Office of Polar Programs, and the Gordon and Betty Moore Foundation. 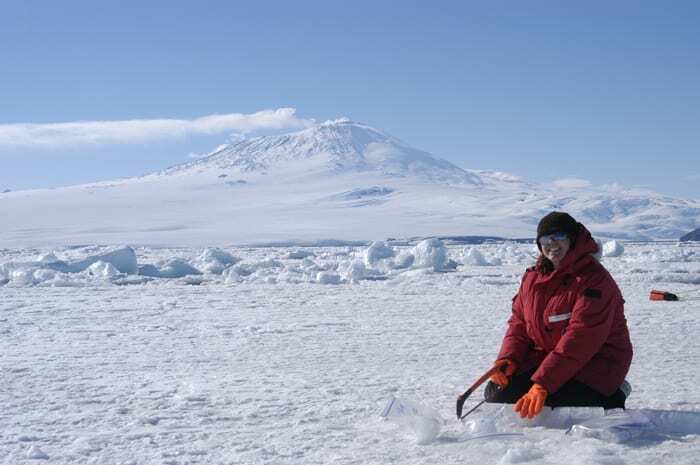 About the author: Erin Bertrand has worked to measure nutrient stress in diatoms in Mak Saito’s lab in the WHOI Marine Chemistry and Geochemistry Department, as part of her research for her Ph.D. from the MIT/ WHOI Joint Program in Oceanography. She has been interested in how the availability of metals in the environment affects microscopic organisms ever since she started conducting research as an undergraduate at Bates College. 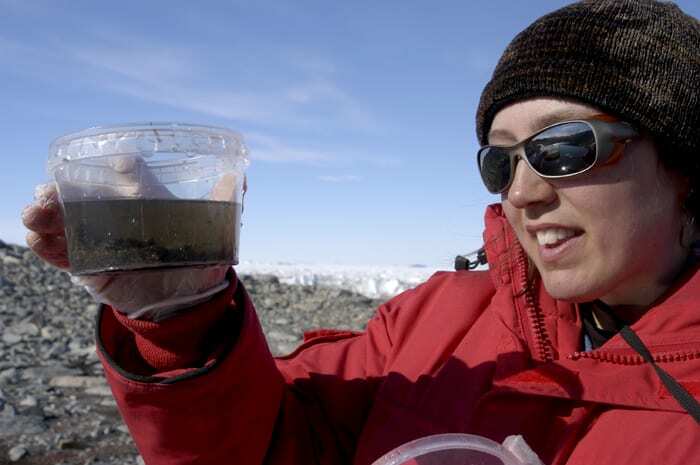 When she is not growing diatoms, extracting proteins, taking samples of phytoplankton in Antarctica, or running the mass spectrometer, she likes to hike or run in the woods, listen to live music, or cook something new for her friends and family. Her mentor on this article was Heather Goldstone, a science journalist for WCAI radio (and a graduate of the MIT/WHOI Joint Program). Why study diatoms and nutrient limitation? Diatoms are one of several major types of marine phytoplankton—microorganisms that live near the ocean surface and convert carbon dioxide into organic carbon via photosynthesis. While all phytoplankton can become starved of nutrients, our lab has focused on diatoms because they are a particularly important group in the ocean, and nutrient starvation is a major factor governing whether they flourish or fade. Diatoms grow quickly and form dense blooms; when these blooms exhaust the available nutrient supply, they can sink quickly down from the surface ocean, transferring large amounts of carbon from the surface to the deep ocean. That process plays an important role in determining how much heat-trapping carbon dioxide the ocean can absorb from the atmosphere. Diatoms are also important because they encase their cells in structures of glass-like silica called frustules. 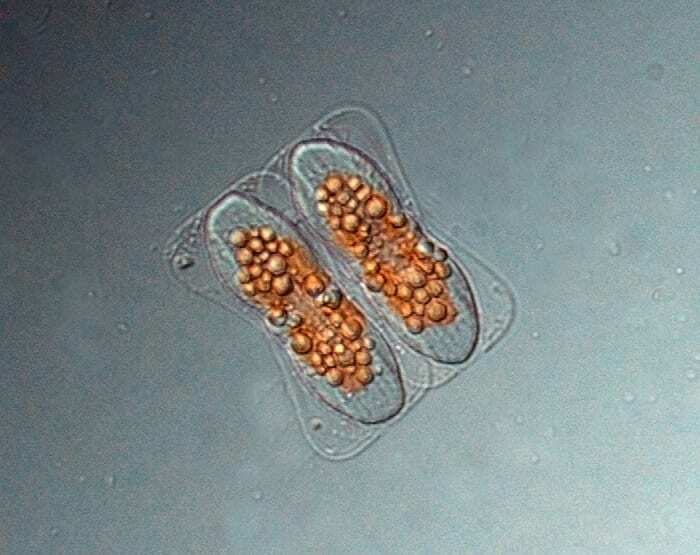 As these frustules form, they incorporate chemical signatures in the water in which the diatoms grow. 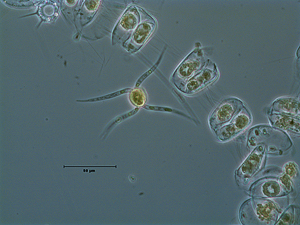 When the diatoms sink to the ocean bottom, some of these frustules get preserved in sediments. 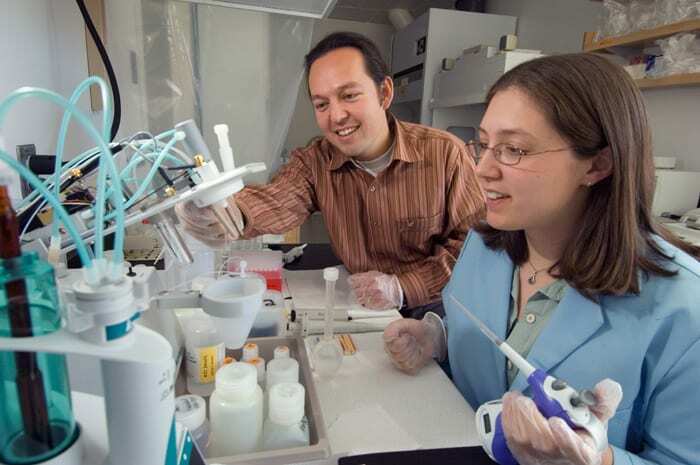 By studying them, scientists can learn a lot about the past chemical composition of the ocean. Scientists have recently developed methods for identifying and measuring large numbers of specific proteins in very complex mixtures. These techniques involve breaking up the proteins into pieces called peptides, separating those peptides, measuring their masses, and examining how they break apart when bombarded with energy. The way a peptide fragments when it encounters this energy is characteristic of its chemical structure. The results are like a puzzle: Scientists fit all the pieces back together and identify the proteins that were in the original mixture. This method, called mass spectrometry-based proteomics, enables a wide range of studies, from finding cancer biomarkers to diagnosing honey bee diseases. Mak Saito’s lab group at Woods Hole Oceanographic Institution has been working to perfect these techniques for studying proteins in the marine environment. Proteins are important in oceanography because they are the “do-ers” in the cell: They catalyze chemical reactions required to support life and are the agents that interact with the environment outside the cell. By looking at what proteins are in use by marine microorganisms, we can learn about the chemistry going on in the ocean, including what nutrients limit phytoplankton growth. These new marine protein measurement techniques will help scientists make predictions about how marine phytoplankton draw down carbon from the atmosphere and produce oxygen and how these processes may change as humans continue to alter ocean chemistry through coastal pollution and fossil-fuel burning. Bacteria and unicellular marine plants called diatoms depend on each other for some essential nutrients, but they also compete for other nutrients. So life gets complicated in the chemical soup of the ocean. 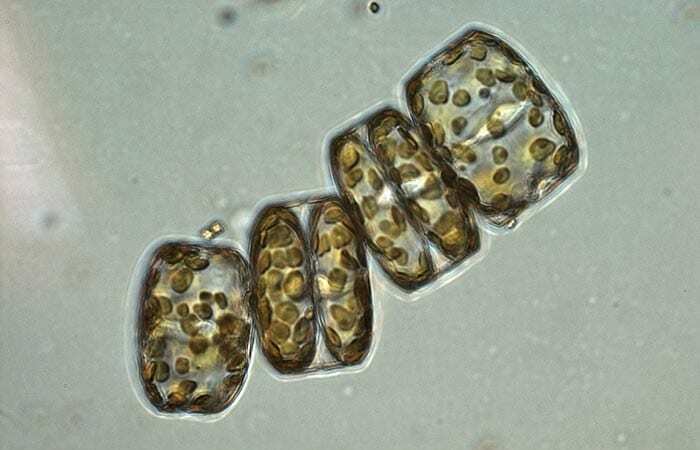 Diatoms convert carbon dioxide into organic carbon via photosynthesis. Bacteria need organic carbon, but many cannot make it. So they rely on diatoms, which release organic carbon into the ocean when they grow, are lysed (broken apart), or are eaten by zooplankton. Diatoms require vitamin B12, but they cannot make it. Bacteria do make it, so diatoms rely on bacteria, which release B12 into the ocean when they grow, are lysed, or are eaten. Diatoms and bacteria both need iron, which is a scarce commodity in the ocean. So they compete for it. 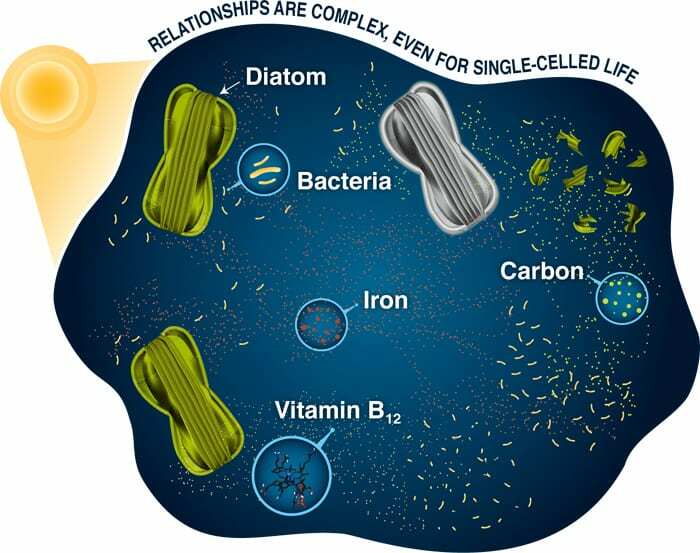 If bacteria use up the iron, diatoms won’t have enough to make organic carbon; if diatoms use up the iron, bacteria won’t have it to make vitamin B12.